A £100 per person deposit is all that is required to reserve your place(s) on this training holiday. You can do this by clicking ‘Add to Cart’ below. The balance invoice will be sent out 5 weeks prior to departure. You do however have the option to pay your balance now by selecting this below. Details about each of the optional extras can be found on our ‘Holiday Specifics’ page. These are all subject to availability. Reserve your place on this Marathon Running Holiday. 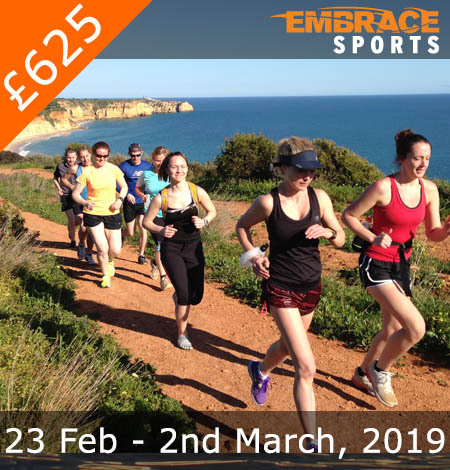 Embrace is once again holding the hugely popular pre marathon running holiday in the Algarve, Portugal. 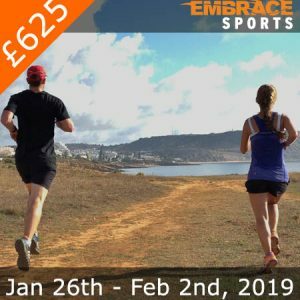 Gearing you up towards the spring marathons or to improve your current running ability you will be armed with great training, coaching, expert tips and advice. The training weeks are for all abilities and will build on your running strength, endurance, speed, technique and knowledge of longer distance running. Outside of the training you will get to stay at luxury sports complex, receive fantastic catering, attend optional excursions and spend time with like-minded runners. This ‘sample’ schedule to give a general idea of what a training week might look like. The reality is this changes a lot due to weather conditions, ability levels, training focuses and athlete feedback / requests. If you want a motivating and supportive running holiday, then this is the place. This was my first ever running holiday and I was a bit uncertain how I would get on, but the coaches and the other guests made the experience so supportive and inclusive, I cannot recommend it enough. The variety of runs and the structure of the week is well thought-through and I’ve come home fitter and more confident for my upcoming marathon. It was a fantastic week with a variety of tough and relax running sessions. The coaches, accommodation, food were just perfect. I really recommend this amazing camp! I am so glad I was persuaded to give a running holiday a go. Fantastic group of people, really effective training, awesome food and much better weather than back home. I left feeling well prepared for my marathon and am looking forward to seeing how my fellow camp mates get on. I can’t recommend Embrace highly enough. I will be back! Fantastic training week with a great group of runners and excellent coaches. The sessions were varied and well thought out. Running may never be the same again! None of which would have been half as much fun without the #hungryrunners and coaches providing all the support and food you need to survive! It was a fantastic week of varied running sessions with awesome people who like running, what’s not to love! The absolute bonus was the food was amazing and you never had to be a #hungryrunner. The sad thing is the week does end and back home you do have to cook your own porridge and there isnt people shouting encouragement on every run you do! What an excellent week’s training. I was nervous of joining a group of marathoners as I’m just leading up to my first later in 2018, but the way the training is put together, it’s suitable for all abilities. No-one will slow you down or make you go faster or further than you want to. You never need to do more than you want to, but running in beautiful surroundings with like-minded people makes it easy to meet and exceed your goals, and to enjoy doing so! The scenery is beautiful, the accommodation clean, quiet and comfortable. The food is amazing, top quality nutrition, with something for everyone. The wine is pretty good too. It’s so great to have a week focused on running, and that leaves plenty of scope for socialising, alone-time, reading, whatever else you’re into. Great exercise, great people, great food, great surroundings, what a great week. Another fantastic week – my third away with the team. As always, the sessions push you in all the right ways, and the extra curricular stuff ( food, social aspect) made the trip a superb way to spend a week. Thoroughly recommend – already booked onto next one. My 6th Embrace holiday and as expected, it was terrific. Running out of original ways to say how wonderful the week’s with Embrace are! Food, accommodation, coaching, location – superb as always. That is what keeps me coming back. It is always a great week spent amongst like minded people running in a stunning location. Highly recommend to anyone of any running ability! Another fantastic week! These guys never fail to deliver: varied training for all abilities; knowledgeable, informative and friendly coaches; fantastic food and great accommodation. I wasn’t training for a marathon, but it didn’t stop me having a very enjoyable week and getting fitter in the process. I shall be back! I’ve become an Embrace regular – as I love these trips. And I’ve now done Marathon camp twice while targeting a half-marathon. Both times I’ve got massive benefit – the coaches tailor each session so that they still work for those of us without 20 mile long runs in the schedule. It’s always great to see familiar faces – and to make new people welcome. Fantastic food, scenic location, good company, training that adapts to the group, the weather, and all the niggles we bring – definitely 5 stars. This was my fifth Embrace holiday and I still had a brilliant time. I banked a great weeks training with old friends and new in a supportive atmosphere. I really enjoyed my week with Embrace and felt I got a lot out of it. The routes were superb – town, woodland, clifftop, track and of course the hills, which really pushed everyone, as illustrated by the fact that only 3 out of the 19 on the camp did not need an afternoon nap. It was a very mixed group in terms of age and pace, so anyone in marathon training should be able to handle it. What surprised me most was that after an intense week of training I could still run 20 miles on the last day at what for me was a decent pace. And of course everything was laid on, including transport, food, wine and beer. This was my first time. I hope there will be a second. 7th visit, which must say almost everything. All the groups across the years have worked really well and been fantastically supportive. Running wise the coaches will help you achieve what you want to whether that is returning to running, a novice or an experienced marathon runner. Accommodation, food and the social side are 2nd to none. This was my ninth Embrace holiday and once again it was an amazing week. What Graeme, Neil and the rest of the coaches is provide a perfect running holiday. Every attention to detail has been thought of from the transport, accommodation, the wonderful food they cook, great training routes, to the fantastic location in the Algarve. The social side is also a real bonus. I’ve made some wonderful friends over the years through these holidays and it’s great to be able catch up with them and at the same time make new friends. These holidays are such a friendly and supportive environment that I would thoroughly recommend them to any runner. This was my first Embrace holiday. I was worried about whether I could keep up with the schedule as my marathon training was behind schedule due to a bout of flu knocking me out from training for almost the whole of January. My aim at the beginning of the week was just to get to the end of the week. I more than did that! The Embrace team were incredibly supportive and it really did not matter that I was one of the slower runners. Everyone has their own goals to achieve and Embrace helped me more than meet those goals. The set up of the holiday was also fantastic. The accommodation was perfect, having your schedule set out for you on a daily basis takes away all the ‘thinking’ you have to do back home and the food was abundant and very well thought through. I am vegetarian and the dietary requirements were perfectly met. I really enjoyed my holiday, feel back on track with marathon training and looking forward to visiting again in future when hopefully I can improve my performance on the hills! If you sign up for an Embrace holiday you can expect expert coaching, challenging but achievable programme, amazing food and accommodation. 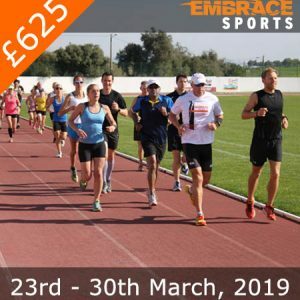 This was my fourth Algarve holiday with Embrace and the thing that sets it apart is the way the runners and coaches come together, supporting each other and above all making it a really enjoyable holiday. The camps are organised so that people of all abilities or runners on a rehabilitation programme (as I was in November) can meet their own personal goals without any pressure to complete all the sessions. I have been on several running camps with Embrace and will keep going back! It’s great value, with varied training sessions every day to suit all running abilities, with encouraging and enthusiastic coaches. The food is delicious and there is time to chillout and relax before the next session. I can’t recommend it highly enough. This was my 5th Embrace holiday and each one gets more enjoyable! 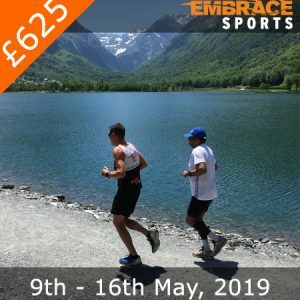 I booked at the last minute when I found myself half way through marathon training and lacking motivation, there was only one thing I knew to get my mojo back….marathon camp- thank goodness there was still a place! The week is challenging, fun, hard work and sociable in equal measure. Suitable for all ages, all abilities and all paces, everyone encouraging and motivating each other. Seeing other people achieve their goals really Spurs the rest of the group on too. Let’s talk about food…..it was outstanding as always. Fresh, nutritious, healthy and super tasty, and plentiful! A great week, with varied training sessions and smashing people. Everyone’s really supportive of each other’s goals & you leave feeling really positive about your future running goals. I’ve been coming on these camps for 6 years. I love them. They aren’t just about the training, they’re about relaxation, support, encouragement, food and laughter. All of this is a winning combination enhanced by lovely Lagos itself. I’ve come on these camps in varying degrees of fitness and can confirm, first hand, that they really do cater for all abilities. No one is left out and everyone’s goals are important. I really can’t recommend these holidays enough. The support, passion and hard work of the coaches is second to none. This is my second Embrace holiday and it was just as good, if not better than last year! The training sessions are varied, the home cooked food is delicious and the coaches are motivated and approachable! This has been much needed marathon motivation for me two years in a row now and I hope to return again very soon! Most (admittedly non runner) friends think a running holiday is not possible! It is. I have been on this holiday 3 times and it is a great balance of training and relaxing. It is surprising how many miles we can cover without having to worry about normal life. The different terrains and structure of the holiday means no two runs are the same and keeps training interesting. I hope to be back for more! A great atmosphere, challenging and mixed running, sessions, lovely spring sunshine – what’s not to like.! This is my second Embrace holiday and it didn’t disappoint. Brilliant training led by professional and friendly coaches in a scenic environment. Want that running goal, then an Embrace Sports running holiday is just the step to take. These guys cater for all abilities with training designed to test all levels across a variety of courses. If you want a week which will challenge you to progress to another level of marathon training then you will love this. A warm friendly relaxing environment, amazing fresh home cooked food and washed down with glasses of wine! I’m already excited about going back next year! Great mix of running and relaxing, in amazingly supportive environment. Another great week of running with the Embrace Crew. I’ve been out a few times now and each time the holiday offers something special. My non-running friends think I’m mad when I say I’m going on a running holiday but with Embrace you can do just that. They’ve set the week up perfectly so you can enjoy a variety of runs; distances and terrains from the Woodland Trail to the Beach. Then relax by the pool. These holidays are great ways to meet with other runners, share experiences and most of all make new friendships. Thoroughly recommend trying a running holiday with these guys! What can I say, it was an all round fantastic experience! Firstly, the food and accommodation was top notch, we had so much fresh food to snack on during the day and every evening the dinners provided were classic dishes at their very best. Don’t go on this trip expecting to lose weight, its about eating well to power your body, for all the great running expeditions throughout the week. It’s great as it caters for all abilities, there something for the novice right through to the top notch club runner! Another fantastic week with the Embrace team, on the marathon training camp! We had a varied mix of training sessions (and weather! ), from long woodland trails to track intervals, from epic hills to barefoot running on the beach, supported by the fantastic coaches, for all running abilities…no-one gets left behind! There was a real camaraderie between all campers, with plenty of encouragement, support, high-fives and laughs to get each other through the sessions. And very spoilt to be catered for all week, from Little Bears porridge to outstanding home-cooked evening meals for hungry runners. Great camp, great coaches, great food, great atmosphere – definitely recommended! I do not have enough good things to say about our amazing trip… every single detail – from the accommodation, to the location, the training, the brilliant supportive fun atmosphere, everything exceeded my expections! In particular the amazing Embrace team made such an incredible effort to cater for our specific dietary needs, the food was absolutely delicious with super healthy options all round all week! Would absolutely recommend for all abilities and I would absolutely love to come back next year! This was my 4th trip in 18 months and as with the other trips, it didn’t disappoint. It is a fantastic week that combines the best of both running and relaxation with like minded people. The food was spectacular as always. As was the week’s training and coaching, even in less than ideal weather! No doubt I will be back again (and again). I enjoyed my first running holiday, and I’ve met with Embrace the perfect choice. The varied sports program, the fresh cooked food, the infrastructure, the trainers, the warm, open and friendly people and not forget the fresh delicious beer from tab ensure a perfect running holiday. Also as a badly speaking English participant I found my place in the group and had a fabulous time. Thank you all, it was fantastic! Ich hatte eine wunderschöne Zeit in der Algarve. Es war mein erster organisierter Sport Urlaub, daher wusste ich nicht genau was mich erwartet. Das Embrace Team liebt was es macht, und als Teilnehmer profitierst du davon. Die Herzlichkeit, die Professionalität und die Leidenschaft der Crew ist beflügelnd. Die Kombination aus Sport, gutem frisch zubereitetem Essen, sehr freundliche, spassige, spannende Mit-Urlauber mit der verbindenden Leidenschaft zu Laufen sind das Rezept für unvergessliche Ferien. This was my first holiday with Embrace. When I booked I wasn’t sure what to expect however on reflection my expectations were certainly exceeded. The training was varied, fun and challenging. Everybody motivated and supported each other which was great to see. Throughout the whole week the food was faultless. The time to train and the time to relax was spot on. The Algarve was absolutely stunning with Lagos retaining its Portuguese charm. It proved to be a fantastic week. First time on this type of holiday and very glad we picked Embrace, the location was great, their set up is very professional yet friendly and welcoming, especially important as many of our group were return visitors, however there was never a feeling of gatecrashing someone else’s party, everyone was lovely. In fact the real highlight was just being in a place with other runners, happy to talk all day about running!! Who ever gets that on their typical family or mates holidays?!! Training was varied which we really enjoyed, built in options to do more or less depending on your personal goals. The accommodation far surpassed our expectations and the hearty, home cooked meals each night were a real highlight. We both left feeling fitter and healthier, if not exactly leaner!! We would recommend and would certainly do it again. Despite nursing an injury I still managed to have a great time and achieve more than I’d expected to. The guys were great at accommodating me. This was my 7th Embrace holiday yet there were still a few surprises, new sessions and routes which was great. Whatever your abilities or stage of your running journey I’d highly recommend an Embrace for a brilliant training holiday.